Intense anticipation is building for the year-end climax to the men’s professional tennis season whereby at The Barclays ATP World Tour Finals the top eight singles players and doubles teams in the world will compete for the crown at London’s imposing 02 Arena. The Finals kick off in spectacular style on Sunday, 21 November, with home grown, Brit, Andy Murray taking on in-form Robin Soderling in the first Group B singles match. The players have been competing all season long for South African Airways ATP Rankings points in a bid to earn a coveted place in the final eight and a chance to win the $1.6m prize money on offer to the winner. 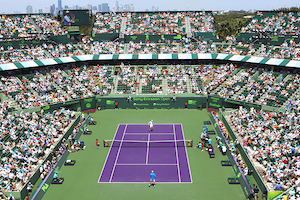 Competition for places was fierce in the run up to the finals, with Fernando Verdasco narrowly losing out to Andy Roddick, David Ferrer and Tomas Berdych for the remaining three spots. This year, world number one, Rafael Nadal faces a rejuvenated Novak Djokovic, Czech, Tomas Berdych and plucky American, Andy Roddick in Group A, while five-time finals champion and world number 2, Roger Federer faces the prospect of in-from Robin Soderling, Britain’s Andy Murray on home turf and diminutive Spaniard, David Ferrer in Group B. All eight players were greeted by Britain’s Prime Minister, David Cameron – an avid tennis fan – at a reception held at 10 Downing Street on Thursday 17 November to signal the start of what bodes to be an incredibly exciting week. “It’s fantastic that the ATP World Tour Finals tournament is back in London for the second year running. It’s great for London and great for the country,” Mr Cameron said. The PM himself gave Murray a warm up in the dining room with a series of volleys back and forth, and the young Scot hopes to have the home crowd on his side on Sunday. “Every tennis player will tell you when you play at home it really helps you to have the crowd behind you,” Murray said at a press conference in London. Last year, despite winning two out of his three group matches, Murray failed to qualify for the semi-finals on game difference, but what are his chances now? The Scot began the year in fantastic form reaching the Australian Open final, only to lose to his nemesis, Roger Federer. The psychological impact of this loss caused Murray to incur mixed fortunes and an inconsistent season which saw him overtaken by Robin Soderling in the world rankings. However, in reaching the semi-finals at Wimbledon, Murray proved that a home crowd could play a significant role. Soderling is arguably the man to beat. Currently riding high on the back of his victory over Gael Monfils to claim his first Masters title in Paris in November, coupled with his penetrating ground strokes indoors, many are tipping Soderling to win the year-end title. After a break following tendinitis in his arm, world number one, Rafael Nadal, despite having a fantastic season, winning three out of the four majors and completing a career grand slam, is not favoured to do well, but anyone would be mad to bet against him. Nadal, who failed to win a single match at the O2 last year, appeared relaxed outside Downing Street on Thursday, but insists he has put no pressure on himself. “This tournament is a more difficult one for me because of the surface, because of the opponents,” he said. Andy Roddick was forced to watch the 2009 World Tour Finals from the stands, after suffering from a knee injury earlier in the season. Roddick will want to prove his critics wrong, after many believed he would not even make it to London this year. Many feel he could well cause an upset this year, starting with his huge opening match against crowd favourite, Rafael Nadal, in his opening match on Monday. 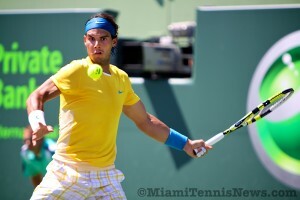 At their last encounter in Miami, Roddick defeated Nadal at the Sony Ericsson Open. Not only did David Ferrer look out of place, being the only player in a grey suit when meeting Britain’s Prime Minister, many have written off the diminutive Spaniard’s chances. However, it would be wrong to dismiss him. His victories against Andy Murray and Robin Soderling this season, as well as a string of consistent performances in the past few tournaments, including his impressive win at the Valencia Open at the start of November, suggest he is in good form. The 2010 Wimbledon runner-up, Tomas Berdych from the Czech Republic, will be experiencing his first World Tour Finals, after rising to a career-high six in the world this year. However, the 25-year-old has faltered in recent weeks, failing to progress past the third round of any tournament. But could the buzz of London help him to end his season on a high? Last but not least, anyone would be crazy to write off the 16-time Majors Champion, Roger Federer. But, despite his success at the recent Swiss indoor event in Basel, throwing away several match points to the unpredictable Gael Monfils in November’s Paris Masters semi-final has thrown a shadow of doubt over his invincibility. The Bryan brothers are clear favourites to retain their doubles title from last year.